Not my favorite book of the trilogy, but then again, final books in a series seldom are, mostly likely because of the high expectations placed on the ending. 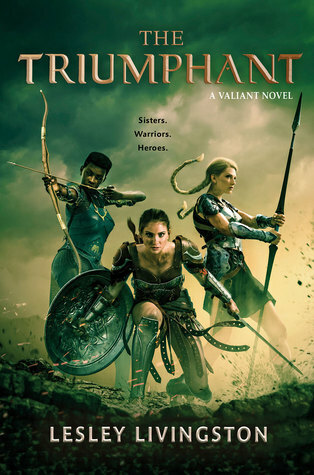 Still, this doesn’t mean The Triumphant wasn’t a great read, because it absolutely was, featuring all the incredible action and memorable characters I’ve grown to love. In a way, I did feel like the scope of the story was a little smaller and less epic in this one, but the conclusion was absolutely unforgettable. Following the events of the previous book, Fallon and her fellow gladiatrices have become the darlings of the Roman Republic. That said, their victory did not come without some negative consequences, one of these being Cai’s dishonorable discharge from the army. Despite understanding the need for this, it still breaks Fallon’s heart to watch her lover now fight for his life in the gladiatorial arenas, knowing that he had given up his reputation and social status to stand with her against his traitorous father. Still, they know they have the favor of Caesar, which goes a long way in securing their livelihood and future as Fallon continues the fight for Cai’s freedom. But soon, the Ides of March are upon them, and treachery in the senate threatens to throw the entirety of Rome into chaos. All the privileges and protection Fallon and her friends enjoyed are now lost, but in far greater danger is Cleopatra, who has gone from beloved of Caesar to his enemies’ greatest target. She needs to a way out of the city, and Fallon and her sister Sorcha are in a position to help. After gathering the other gladiatrices, they formulate a daring plan to escape Rome and make their way to Alexandria, the seat of Cleopatra’s power. Beyond that, Fallon does not know where her heart will lead her, but perhaps the Queen of Egypt is not the only one who needs to return home. It’s not too difficult to figure out that the crux of The Triumphant is the assassination of Julius Caesar and the ensuing catastrophe it causes our characters, and in fact the event and its aftermath takes up the bulk of this story. While it is significant, Caesar’s death is also no big twist and thus I felt this final volume lacked a lot of the surprises that so delighted me in the first two books. Much of this one featured Fallon and her companions simply reacting to the reality of their new circumstances instead of driving the plot. However, as with the previous novels in the series, Lesley Livingston has also added her own flourishes to the history to make things interesting, including familial drama, additional conspiracies, and a touch of the darkly mystical. The action is also top-notch with superb fight scenes and battle sequences. This has always been one of my favorite aspects of this series because the author has such a knack for describing the action so vividly that everything plays out like a movie in your mind. At this point, I’ve also grown comfortably attached to all these characters, and yet it still surprised me how much it hurt whenever we lost someone. It’s a testament to how well they’ve been written and developed that I should feel so emotionally invested in their fates. In addition, the friendships that have been forged between Fallon and her gladiatrix sisters are those I will remember for a long time. I think it’s safe to say that our protagonist got the ending she’s earned for herself and the friends, and the final pages were deeply satisfying as a result. All in all, I was very happy with The Triumphant and the way it concluded the Valiant trilogy, and I honestly can’t remember the last time I had this much fun with a YA series. Lesley Livingston is now a must-read author for me; anything else she writes, I’ll be there. Audiobook Comments: I’ve said it before and I’ll say it again: Fiona Hardingham rocks. Fortunately for me, she narrates a lot of YA and my heart always does a little cheer whenever I see her name listed for an audiobook I’m looking forward to. Her voice was absolutely perfect for Fallon: powerful, fierce, and full of strength. Glad to hear this mostly ended well! Now that the entire series is out I really need to get to these- they sound really good. Yeah I know, can you believe it’s already been two years since book 1 came out? Time flies! She’s great, isn’t she! I love her voice, it’s perfect for so many strong YA heroines. I still need to read book 2! Encouraging to see it ends well. Haha, hope you get to read The Defiant soon! Great review! I haven’t read these. I do agree with you that final books are tough because of the expectations.